The most common treatment for mesothelioma involves a combination of surgery, chemotherapy and radiation therapy. Supportive treatments can help relieve symptoms and improve quality of life for many mesothelioma patients. Dr. David Sugarbaker, a pioneer of mesothelioma treatment, on the most effective strategies for treating the disease. The American Society of Clinical Oncology in 2018 published its updated mesothelioma treatment guidelines that doctors follow when treating patients diagnosed with mesothelioma. Clinical trials can also provide patients with emerging therapies. These include immunotherapy, targeted therapy and photodynamic therapy. Type of mesothelioma, stage, cell type and other factors decide the best treatment. Pleural mesothelioma affects the lining around a person’s lung. This lining is the pleura. Patients diagnosed in the early stages benefit most from surgery. It offers them the best chance at living longer lives. These procedures remove tumors from the chest area and improve quality of life. 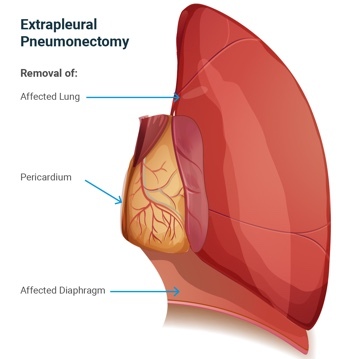 Extrapleural Pneumonectomy (EPP): EPP removes the cancerous lung and all nearby areas where mesothelioma spreads. This can include nearby lymph nodes, parts of the chest lining, heart lining and diaphragm. 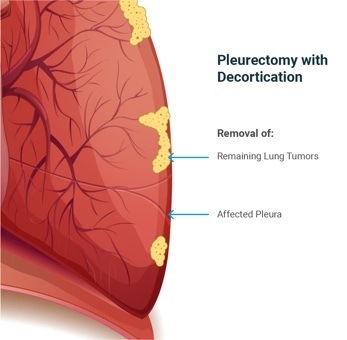 Pleurectomy Decortication (P/D): P/D spares the lung and only removes cancerous parts of the pleural lining, the chest wall lining and the diaphragm. This is a less aggressive surgery. Doctors may recommend chemotherapy to patients who are not eligible for surgery. This mesothelioma treatment also helps extend survival rates. A 2016 Wayne State University study found patients given a combination of chemo drugs lived three times longer than patients without it. Hyperthermic intrathoracic chemotherapy (HITHOC): An experimental procedure that delivers heated chemotherapy drugs throughout the chest cavity. Radiation therapy controls symptoms when surgery is not an option. It eases symptoms such as chest pain and discomfort. And it can also reduce the risk of local recurrence when combined with surgery. Hyperthermic intrathoracic chemotherapy may help pleural mesothelioma patients, too. It delivers a heated chemo drug treatment to the chest cavity after surgery. Mesothelioma doctors are testing and improving this procedure. Three tips on recovering from mesothelioma surgery by top specialist Dr. David Sugarbaker. Peritoneal mesothelioma forms on the tissue lining the abdomen. This lining is also known as the peritoneum. Heated Intraperitoneal Chemotherapy (HIPEC): This is the most effective mesothelioma treatment option for this type of the cancer. Doctors deliver heated chemotherapy drugs into the abdominal cavity after surgery. The process kills remaining cancer cells. Cytoreductive Surgery: Removes cancerous growths from lining of the abdomen. HIPEC often follows this treatment. Conventional mesothelioma treatments, including radiation, may also help peritoneal mesothelioma patients. HIPEC helped 3 out of 4 patients survive at least five years after the procedure. Multimodal therapy combines two or more conventional treatments. Another name for this therapy is multimodality treatment. The 2018 ASCO mesothelioma guidelines show multimodal therapies resulted in an overall survival of 13 to 23.9 months. Learn all about mesothelioma treatment, including diagnosis, prognosis, and more. Palliative treatment is also known as supportive care. It can improve quality of life and relieve symptoms from the cancer and its therapies. Thoracentesis: Removes fluid buildup around the lungs. Pleurodesis: Eliminates space where fluid can develop. Radiation: Can shrink tumors to reduce chest pain. Paracentesis: This is for peritoneal patients. It removes fluid buildup from abdominal area. Pericardiocentesis: Doctors use this for pericardial mesothelioma patients. It removes fluid that collects in the sac surrounding the heart. A 2016 study in Current Medical Research and Opinion shows earlier palliative care lessens pain at all mesothelioma stages. What Are the Emerging Treatments for Mesothelioma? New mesothelioma treatment options in development include immunotherapy and photodynamic therapy. Researchers are testing these in clinical trials to ensure safety and efficacy. At some point, these experimental treatments could become conventional treatments. Clinical trials are medical studies. They involve patients who take experimental treatments or a combination of new procedures. The goal is to find a cure or improve life expectancy. Doctors and researchers track these studies. Mesothelioma patients are eligible for clinical trials. Some of these studies are free. Olaparib for Malignant Mesothelioma: Researchers will investigate if the drug olaparib can cause shrink tumors in people with certain gene mutations. Combining LMB-100 with SEL-110: The drug LMB-100 kills mesothelioma tumors. But antibodies reduce its effectiveness. Researchers will add the drug SEL-110 to see if it prevents antibodies from forming. 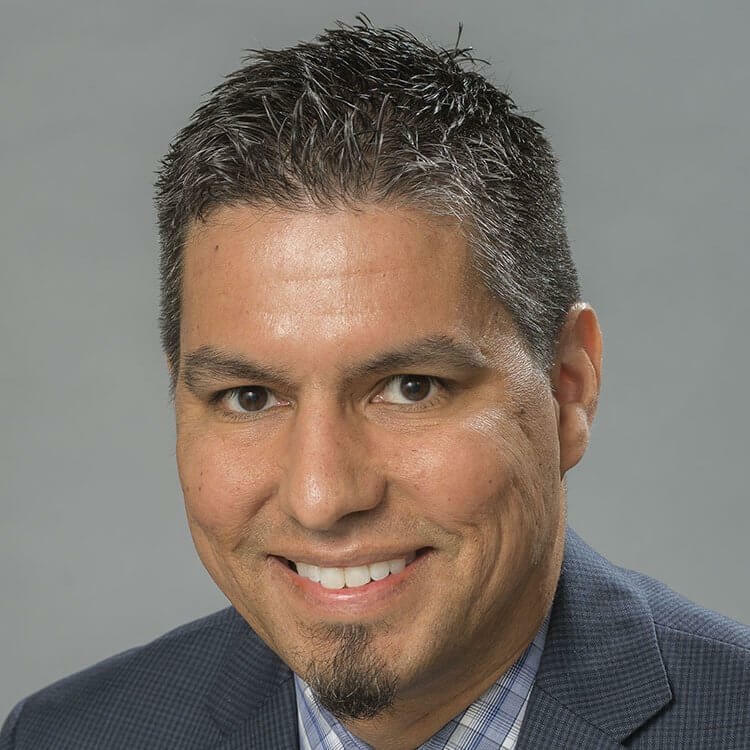 Pembrolizumab for Advanced Pleural Mesothelioma: Researchers will examine the side effects of pembrolizumab and if it can outperform the standard chemo drugs. Immunotherapy is a treatment using drugs to boost your immune system to fight cancer. It is also known as biologic therapy. Pembrolizumab (Keytruda) and nivolumab (Opdivo) already treat various cancers. Mesothelioma could be next. Doctors inject a light-sensitive drug into the patient. After a few days, they apply a special light on the area, usually via laser, to activate the drug and kill cancer cells. Most mesothelioma patients choose complementary and alternative medicine to improve their health. These are best used alongside conventional treatments and with a doctor’s approval. Maintaining a well-balanced diet through proper nutrition helps recovery. Eating the right foods before, during and after treatment can improve your well-being. As a part of any treatment plan, patients should maintain a balanced diet in order to maintain weight and energy. A diet rich in protein and high in calories is best for mesothelioma patients. Following proper nutrition guidelines and advice from a dietitian can help patients improve their well-being and recovery time. What Is the Cost for Mesothelioma Treatment? The average cost for treating malignant pleural mesothelioma and lung cancer is similar. The National Cancer Institute shows treatments for lung cancer can cost $60,709 in the first year. Cost is difficult to estimate. Every case is unique, and each type of therapy carries its specific expense. Chemotherapy: A 2013 study comparing pemetrexed plus cisplatin shows the combination costs $40,102. Final chemotherapy costs depend on type of cancer, drugs used and the patient. Radiation: A 2015 study in the Journal of Oncology Practice shows the median cost for a course of radiation for lung cancer patients was $9,000. Total cost depends on your health coverage and the number of treatments you receive. Surgery: A 2011 National Cancer Institute study shows a stage 1 lung cancer patient could pay $26,235 a month for surgery. Not all mesothelioma patients are eligible for surgery. A late diagnosis means surgery is not helpful. These costs may create stress for mesothelioma patients and their loved stress. Early financial planning could ease some of these concerns about paying for treatment. There are several mesothelioma specialists who have spent years treating this rare disease. They also continue learning about the latest treatment options. Oncologists: The primary doctor who oversees a mesothelioma patient’s care. They will plan any chemotherapy and coordinate with other doctors. Thoracic Surgeon: These doctors train under other mesothelioma surgeons for years. The training sets them up to perform these complex surgical procedures. Every cancer is different and so is every mesothelioma treatment center. Mesothelioma patients should find a center specializing in the treatment of this rare cancer. In fact, the best cancer centers offer a multidisciplinary approach to treating mesothelioma. Patients at these centers have a team of doctors from different specialties, not one. Some of the top mesothelioma specialists work at these types of centers. For example, Dr. Jacques Fontaine is at the Moffitt Cancer Center in Tampa. Fontaine trained under the late mesothelioma pioneer Dr. David Sugarbaker. Dr. Abraham Lebenthal works at Brigham and Women’s Hospital in Boston. He also studied under Sugarbaker. Thankfully, there are several experienced mesothelioma specialists at centers across the U.S.
It’s important to remember there is no one-size-fits-all approach to treating mesothelioma. An early diagnosis offers the best chances of survival. It also helps to develop a treatment plan with your multidisciplinary team and a strong support system including caregivers, family and friends. National Cancer Institute. (2016, October 14). Malignant Mesothelioma Treatment (PDQ)–Health Professional Version. Munkholm-Larsen, S., Cao, C. Q., and Yan, T. D. (2009). Malignant pleural mesothelioma. Stahel, R.A., Weder, W., Lievens, Y., and Felip, E. (2010). Malignant pleural mesothelioma: ESMO Clinical Practice Guidelines for diagnosis, treatment and follow-up. American Cancer Society. (2017, June 6). Radiation Therapy Basics. National Cancer Institute. (2011, January). Annualized Mean Net Costs of Care. Shah, M. et al. (2013, August 7). Cost effectiveness of first-line pemetrexed plus platinum compared with other regimens in the treatment of patients with nonsquamous non-small cell lung cancer in the US outpatient setting. Glover, L. (2016, March 8). How Much Does Chemotherapy Cost. Paravati, A. et al. (2015, August 11). Variation in the Cost of Radiation Therapy Among Medicare Patients With Cancer. Schil, P. et al. (2014, August 31). Multimodal management of malignant pleural mesothelioma: where are we today?